Comet 209709A. Model 44C "Magnum" Drive Clutch. 3/4" Bore. 3/16" keyway. Cushman Products #209709A. Home > Comet Clutches and Parts > Comet 203039A - Green Compression Spring for 40/44 Series Comet Industries Drive Clutch. > Comet 209855A. RED 3/4" Pucks. Set of 3. Comet 44 Magnum Series Drive Clutch. > Comet 209406A. 3-Pack of “White” Solid Puck Kit > Comet 209709A. Model 44C "Magnum" Drive Clutch. 3/4" Bore. 3/16" keyway. Comet 209709A. Comet Industries 44 Series MAGNUM Drive Clutch. 3/4" Bore. Comet/Salsbury/Cushman Part 209709A. MADE IN USA! Genuine Comet Industries part. Replaces Cushman Products Primary Clutch 209709-A. 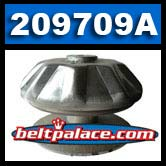 209709A Comet Industries 44C Series Centrifugal Clutch. Approx. engagement: 1900 RPM. 3/4" Bore, 3/16" keyway, MAX 18HP, 4 Cycle, 5000 RPM. Comet 44C (Magnum) Series Drive: 3/4" Bore, for Cushman Product's Golf Cars.